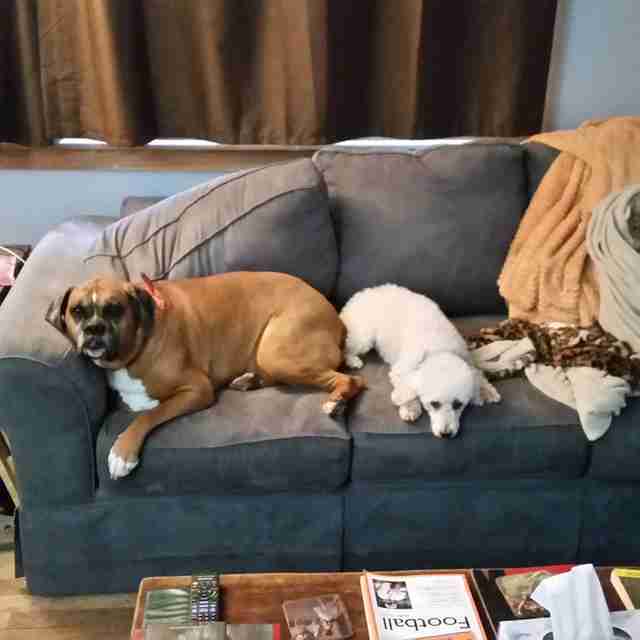 For over 10 years, Gracie the poodle and Brandy the boxer were at each other’s sides through it all. 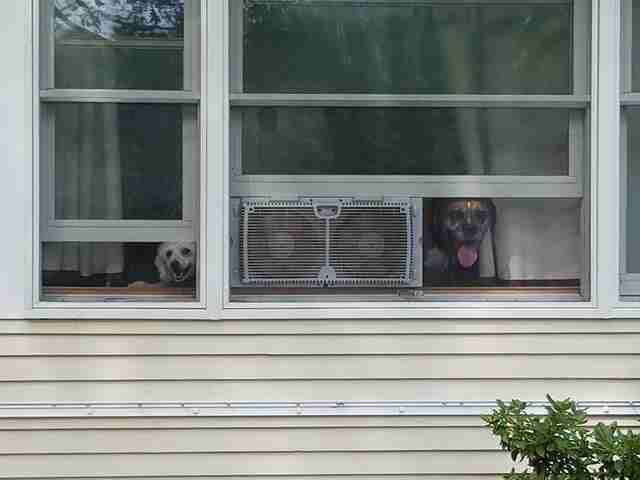 Whenever someone was at the door, they were right there together checking out the scene. 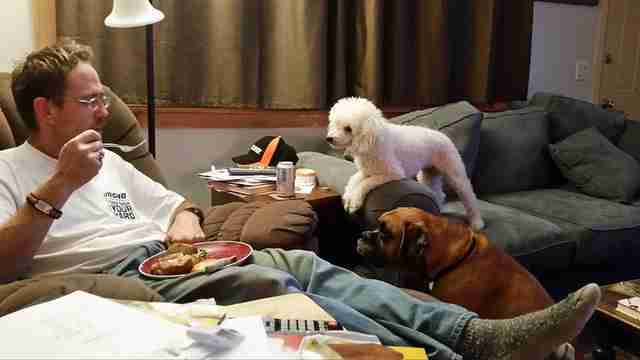 When Dad was eating a snack, they were putting their heads together and giving their best puppy dog eyes to convince him to give them a bite. And if a big dog got too rambunctious with little Gracie, Brandy was right there to defend her. But last week, the Massachusetts family faced a devastating loss. Brandy had been battling cancer for a long time, and there was nothing else the vets could do to keep it from spreading. Gracie was right there with Houser and his wife, Jennifer, when they had to say goodbye. Gracie, who is 14, was not typically very snuggly toward Brandy — but at that moment, she did the sweetest thing. A few days after saying goodbye, Houser came across Brandy’s favorite toy and decided to put her old collar on it. It was a little stuffed boxer that looked just like her. 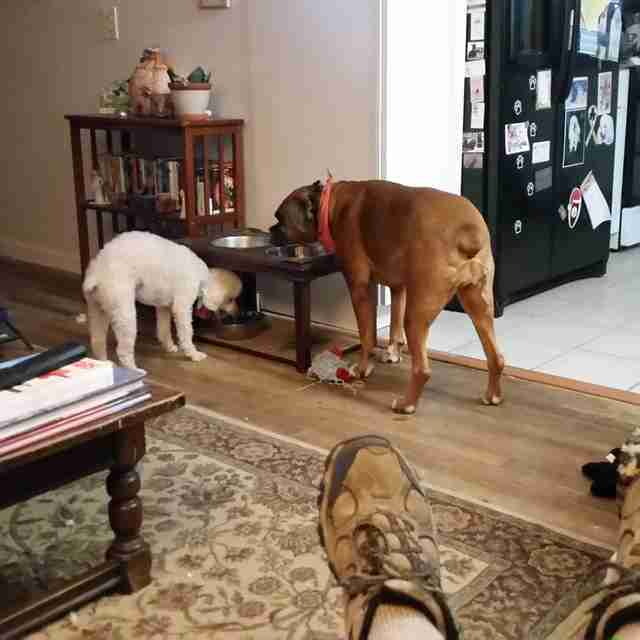 The next thing he knew, Gracie had found the toy, and climbed up onto the couch with it. She wrapped her little paws tightly around it and started cuddling. It was clear just how much Gracie was missing her sister. 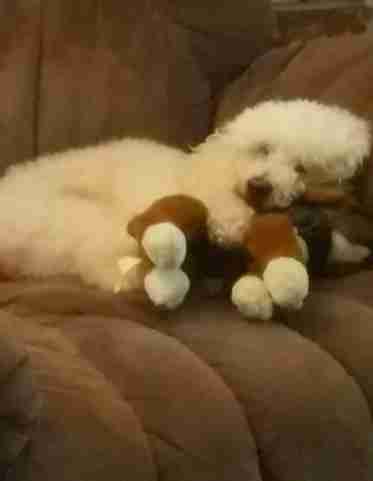 She had been wandering around the house looking for her for days — and to see her cuddling the toy Brandy loved the most truly moved Houser. Then, something happened earlier this week that seemed to be a sign from the family’s late pup. An acquaintance contacted the family with news that they were no longer able to keep their dog, and asked if they could take her in. The 3-year-old cane corso, named Layla, has been living with the Housers for a few days now — and it’s likely she’s found her new forever home with them. Every dog enters your life for a reason, and in times of grieving, it can be the most comforting and welcomed feeling to help another one in need.